Kid Friendly Breakfast Pizza is Giving Back with a Mission for Nutrition! 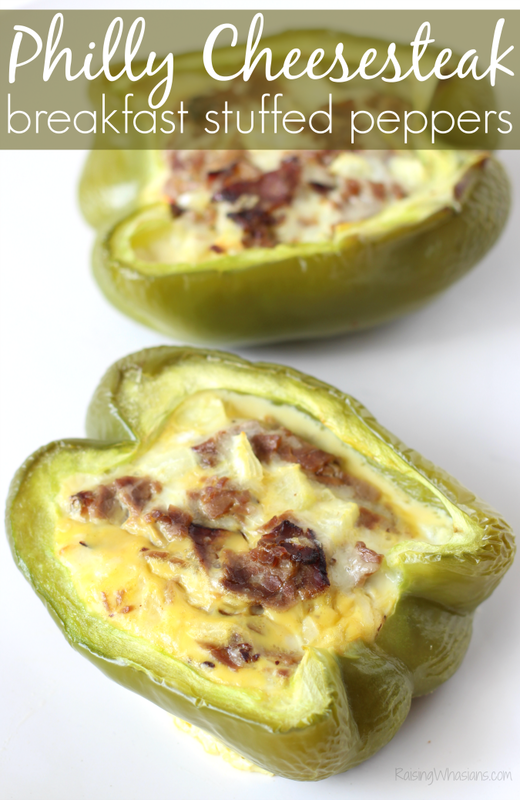 Need a new healthy breakfast idea for kids? Try this Kid Friendly Breakfast Pizza recipe & find out how to donate meals with the new Mission for Nutrition program! This post is sponsored by Produce for Kids. All delicious opinions are my own. Cold pizza for breakfast? That’s healthy? Oh yes! My kids are at it again! Breakfast during the school week is a tough meal for my kids to eat. Our busy mornings equal huge struggles as I beg my kids to eat ANYTHING before heading off to school. And I know you understand how much kids need breakfast to fuel those brains for learning! Always up for a twist, I’m bringing excitement back to our school morning routine with this kid friendly breakfast pizza! 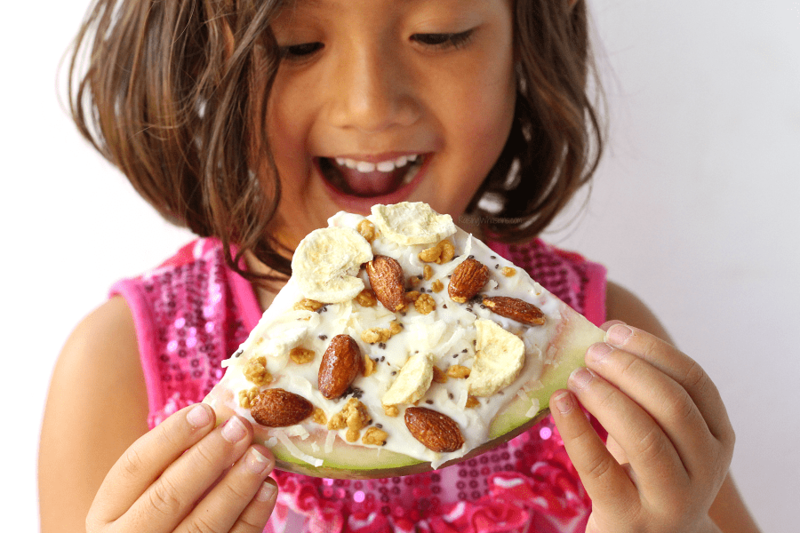 Jazz up your kids’ breakfast with this easy, fun and healthy idea to beat the morning rush and find out how this pizza is not only fueling little minds but giving back healthy meals to families in need! Buy participating produce brands now through March 31, 2019. Participating brands include: RealSweet® Sweet Onions, Earthbound Farm® Organic Spring Mix, NatureFreshTM Farms Cherry Tomatoes, National Watermelon Association, Avocadoes from Mexico, Pero Family Farms Snipped Green Beans, Eat Smart® Salad Kits, Crispy Green® Crispy Fruit. Head over to www.themissionfornutrition.com to download your meal planning eBook with tips, recipes and more. Help donate 80,000 meals to families in need in partnership with Feeding America! 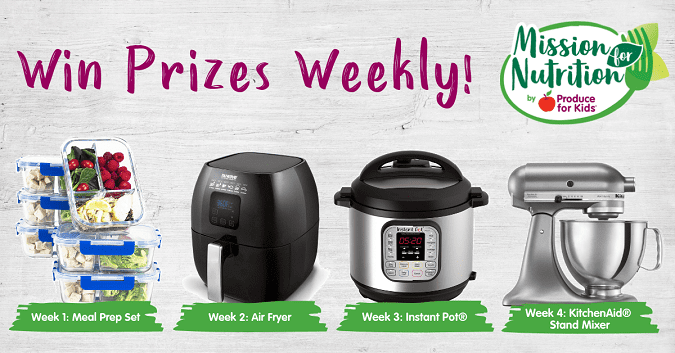 You can also enter the weekly sweepstakes to win prizes like a Kitchen Aid stand mixer, Instant Pot and more! Whip up a quick, easy and healthy breakfast that your kids will love with this Kid Friendly Breakfast Pizza. 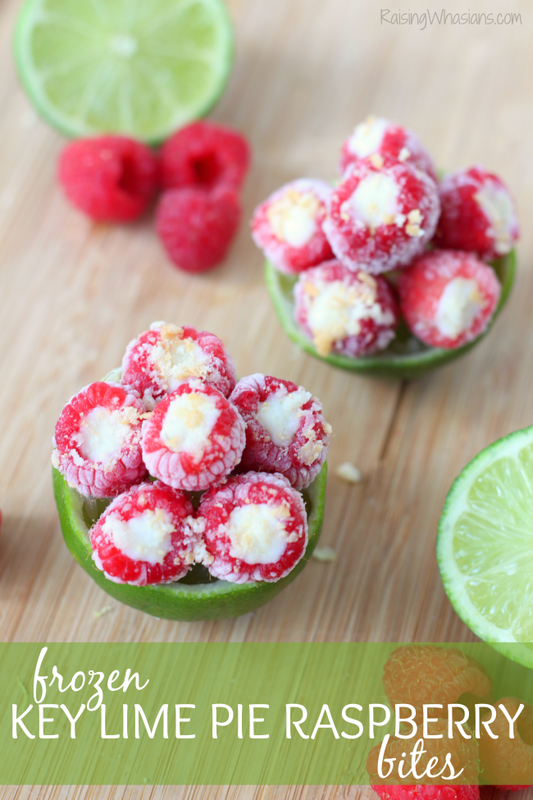 Full of fun ingredients (your kids will love helping to put on the toppings!) and giving back meals to families in need, I couldn’t think of a better way to say good morning! 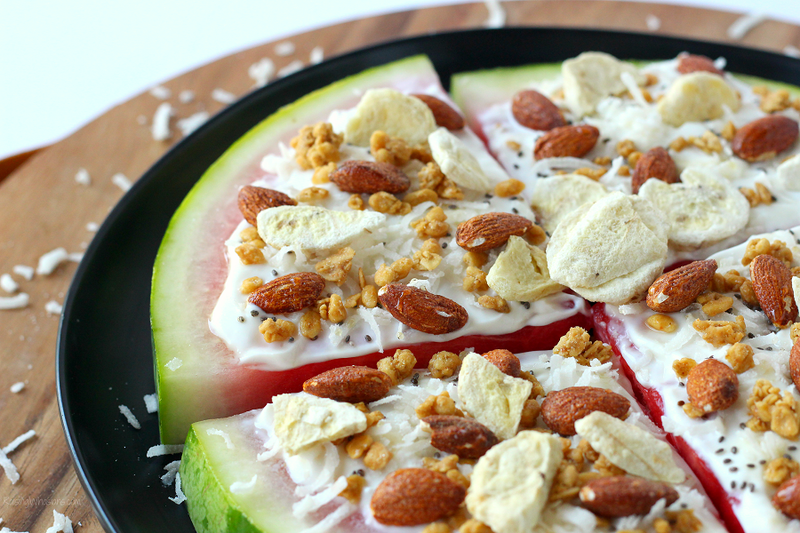 Cut watermelon into pizza slice wedges. 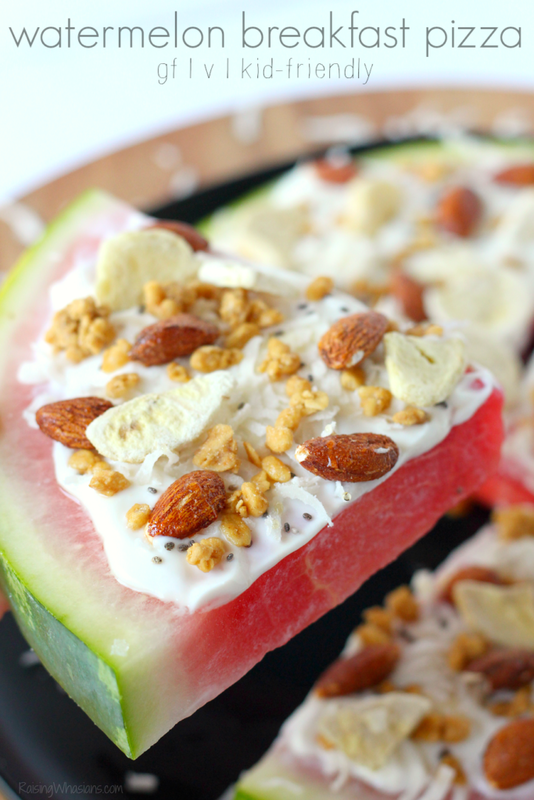 Spread Greek yogurt to cover the top of the red watermelon slice. Drizzle with honey! Serve immediately. YUM! Your kids will love pizza for breakfast! I know that I do! 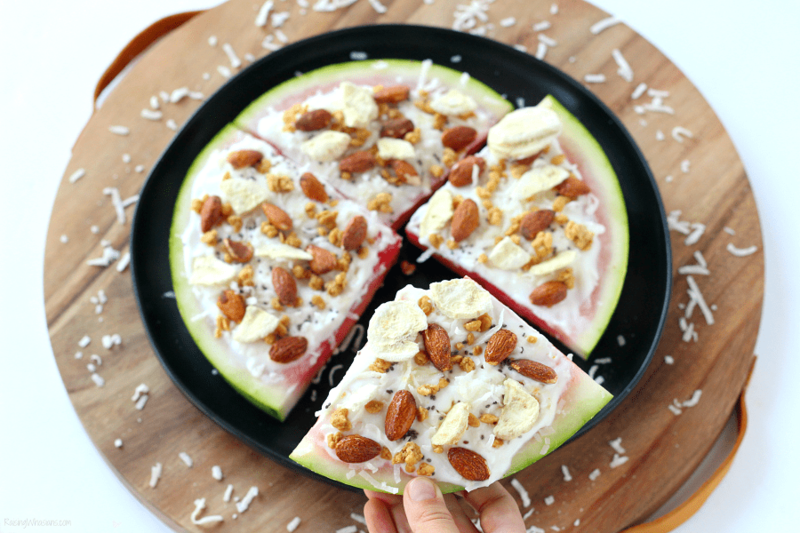 Gluten-free, healthy and kid-friendly, my kids will gobble up watermelon breakfast pizza on busy school mornings. No need to tell them twice! 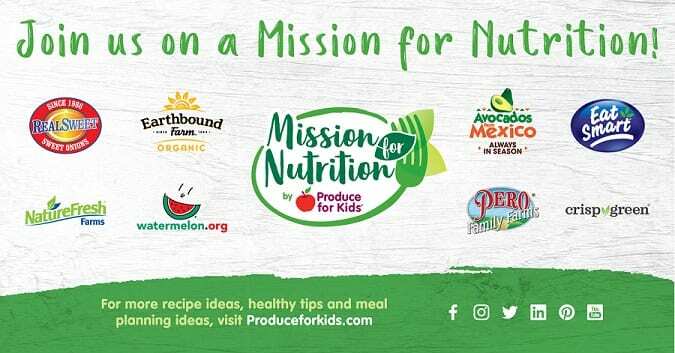 Stand with me this March for National Nutrition Month and Produce for Kids’ new program, Mission for Nutrition. It’s a delicious way to incorporate more healthy eating for any meal of the day, give back meals to families in need and win! What are your kids eating for breakfast on busy school mornings? 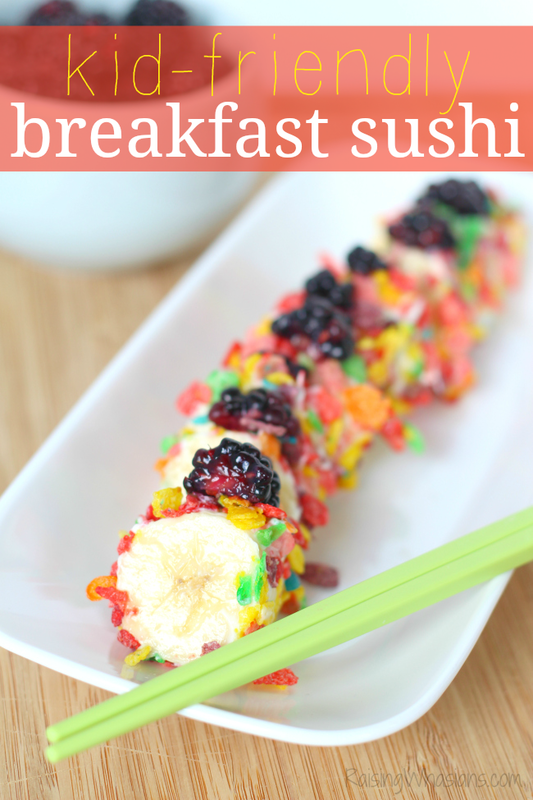 Need more healthy kid breakfast ideas? Be sure to follow Raising Whasians via Facebook, Twitter, Google, Instagram, Pinterest and YouTube for more delicious recipes, kid crafts and travel tips. this looks really good,. My grandsons would enjoy this. That is a wonderful idea for breakfast or any time.